“Dunbar spoke about the particular vindictiveness of a producer/director of music at the BBC who derailed his musical career in Europe. Dunbar described that director of music as “despicable and vile” and the BBC “as stubborn as mules and ruthless as rattlesnakes”. These allegations have been supported by another credible source and there are several very good reasons why they cannot be conveniently swept under the carpet as is done in the BBC History Magazine article. The first reason is these events are recent history contemporaneous with other high profile wrongdoings that, quite rightly, have been the subject of considerable scrutiny. Rudolph Dunbar had arrived in Britain from Guyana, part of the Caribbean region, in 1931. The Windrush scandal, which understandably has been a media cause célèbre, concerns migrants from the Caribbean who arrived in Britain in 1948. Another media cause célèbre, the Jimmy Savile scandal, centred around the BBC entertainer's conveniently ignored prolific sexual abuse in the late 1960s and early 70s; which is the same time that Rudolph Dunbar's career went into decline. Elsewhere another Guyanese source observed that "Dunbar, who had previously conducted the BBC Symphony Orchestra, blamed the BBC and a particular producer/director in the organization for derailing his career. In those days, the BBC was powerful enough to open doors and close doors to people in the arts and music". The power exercised by the BBC is is even stronger today, and concern about the uses that power is being put to provides the second reason why the explanation for the mystery of the decline of Rudolph Dunbar's career needs to solved. My first post profiling Rudolph Dunbar appeared here in 2007 and was part of a long running and continuing campaign to highlight the neglect by the classical establishment of musicians of colour. In the eleven years since then, thankfully there has been laudable progress in redressing that neglect. But as the Financial Times headline "Chineke!, BBC Proms — a step towards righting the inequalities of years" pointed out, recent changes are just a step in righting the wrongs of the past. Which means the problem of inequality in classical music is still a long way from being solved despite recent high-profile initiatives. We must beware of ethical whitewashing over the sins of the past by the BBC in particular and the classical establishment in general. Musicians should be judged and marketed solely on their ability to make great music, not on their colour or gender. (Many of the points I make here also apply to the much-needed but dangerously fashionable rehabilitation of women musicians.) The marginalisation of both musicians of colour and women musicians resulted from the imposition by the classical establishment of a caste system. Musicians of colour and, to a lesser extent, women were categorised as Dalits - untouchables. But now the music industry has realised that when these previously untouchables are moulded into media-friendly celebrities, they become a highly marketable proposition. So the Dalits have been elevated to Brahmins; because today's commercial imperative means what is best is what sells the most. That is, of course, until something else sells better. At which point the caste hierarchy will inexorably be adjusted again in favour of the next big thing. Classical music should have no caste divisions, and inequality cannot be abolished by simply rearranging the caste hierarchy in response to populist pressures. 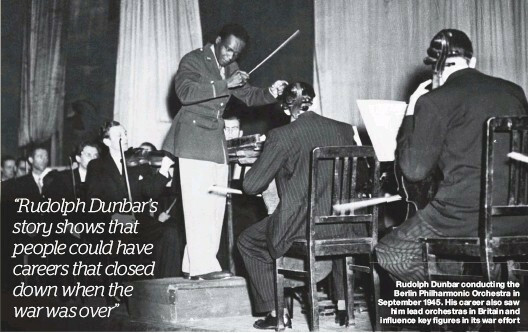 As another post highlighting the unsolved mystery of the closing down of Rudolph Dunbar's career stated, there are no quick fixes for classical music's institutionalised discrimination. * The copyright for this previously unseen photo of Rudolph Dunbar conducting the Berlin Philharmonic is owned by Getty Images. Which is why I have reproduced it from the BBC History Magazine. If I had used the original photo without the captions I would have had to pay Getty Images £480 or risk a copyright action. I am totally in favour of copyright protection for the creators of intellectual property. But Getty Images did not create this property: they simply bought it as a fungible asset. Getty Images are owned by The Carlyle Group, which is an American multinational private equity, alternative asset management and financial services corporation which bought it in 2012 for $3.3 billion. The Lebrecht Photo Library is another leading acquirer and reseller of arts related photo copyrights.